Delta planes site on the runway at LaGuardia Airport in New York City. The push to raise wages for low-paid workers has arrived at New York's airports. New York Governor Andrew Cuomo announced Friday that 2,000 contract workers at Delta Air Lines (DAL) facilities at LaGuardia and John F. Kennedy airports will receive a $1-per-hour pay hike. Delta has agreed to eventually hike the wages of employees earning $9 an hour or less to $10.10 an hour, the same pay rate President Obama recently ordered the federal government to pay contractors. Delta will also make Martin Luther King Jr. Day a paid holiday, and has committed to further talks with the Cuomo administration on improving wages and benefits. "New York should have world-class airports that we as a state can be proud of -- and the only way that is possible is if employees who keep our two busiest airports running are compensated fairly," Cuomo said in a statement. Related: Biden compares LaGuardia to "third-world country"
Pat Foye, head of the New York-New Jersey Port Authority, sent a letter to several major airlines last week demanding they increase wages for the 8,000 total contracted employees at LaGuardia and JFK, and eventually bring them up to $10.10 per hour. These workers do a wide range of jobs for the airlines, from baggage handling to sky-cap services to cabin cleaning and security. 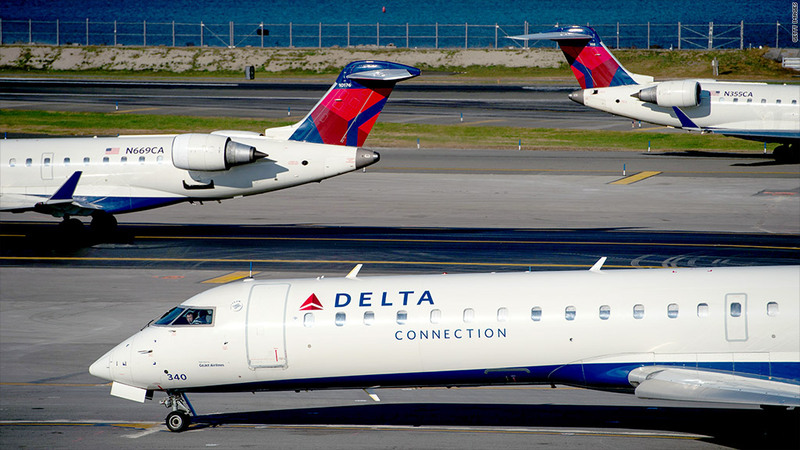 Port Authority and New York officials hope the other airlines addressed in the letter -- United (UAL), American (AAL) and JetBlue (JBLU) -- will follow Delta's lead. American declined to comment Friday; the other two firms did not respond to requests for comment. "As the largest airline in New York, we work hand in hand with the Port Authority, the Governor's office and many partners," a Delta spokesperson said in a statement. "The people that work at the airport are our neighbors, friends and members of our community. We value their contributions to our operation." The airport contractors aren't unionized, but they marched alongside union activists on Martin Luther King Jr. Day last month in a protest calling for an end to "poverty wages." 32BJ, a union of property service workers affiliated with the Service Employees International Union, called Delta's announcement a "big win," and said it hope to see the reforms expanded to the Newark, N.J. airport and others. The group is organizing a protest for Newark airport workers Monday. "We will keep fighting for economic justice for airport workers and their families," the union said. "Not just in New York and New Jersey, but up and down the east coast from Boston to Miami." The news comes amid mounting efforts nationwide to help low-wage workers. Obama's directive on federal contractor wages affects less than half a million people, but administration officials hope it will help spur Congress to pass broader legislation on the issue. While this may be unrealistic, state and local governments have been taking action on their own in recent months. Voters in SeaTac, a tiny town centered around the Seattle-Tacoma airport in Washington, voted last year to raise the local minimum wage to $15 per hour. Seattle's new mayor, Ed Murray, has also called for a $15 minimum for the city's government workers. New Jersey residents voted last year to raise the state's minimum hourly wage by $1 to $8.25, and on January 1, 12 other states and three cities raised their wage floors, as well. The issue gained prominence last year, with workers from McDonald's (MCD), Wendy's (WEN), Wal-Mart (WMT) and others joining protests for higher pay, better hours and improved benefits. CNNMoney's Emily Jane Fox contributed reporting.